Research suggests that these six techniques are powerful to change behavior. They have made all the difference for me. But to understand the power of these techniques, it is helpful to think of behavior as a set of habits, both good and bad that consist of inputs and outputs in a predictable pattern. 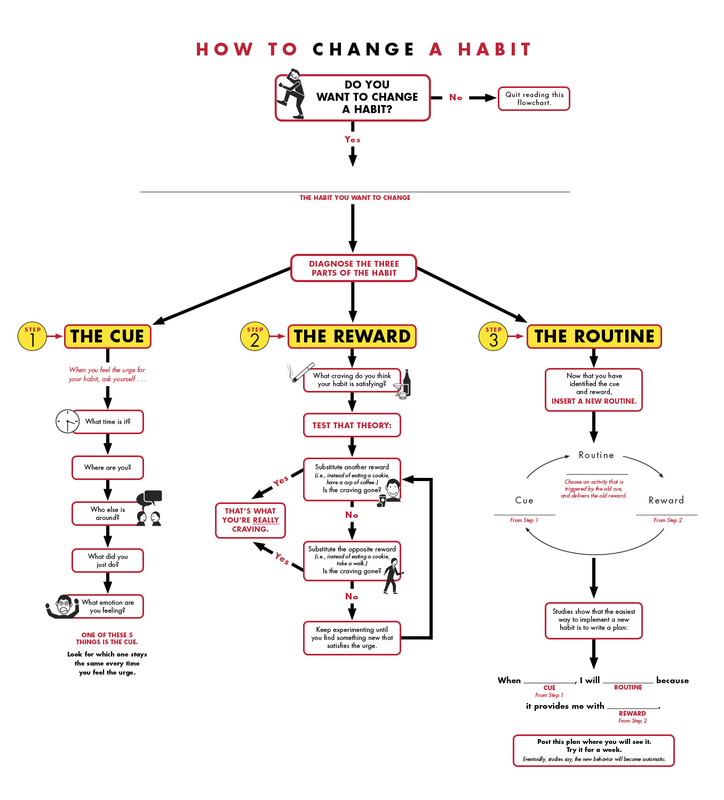 Charles Duhigg, author of The Power of Habits has created a very helpful graphic that documents the three primary components of a habit which he calls: the cue, routine and reward. Duhigg’s research also suggests that habits can’t be eliminated but that they must be replaced, more specifically that the routine is the component we can control. I choose to insert ‘urges’ as the second step in my own model and I suggest that it is the urge we have most control over. Let me define these four steps and then perhaps the six techniques will make more sense. Trigger - This is often an external event or a subconscious thought that ‘appears’ on our mind’s stage. It may be tied to geography or time of day. Here is an example: Seeing that street corner coffee shop on your drive to work may be the trigger. Your alarm sounding each morning is another trigger. When your spouse says that one thing, that may be a trigger. When you sit in that chair, it may be a trigger. When you see that one friend, it may be a trigger. Urge - This is the virtual stage where we play out the routine and reward in our mind. We begin to create the plan for the routine and for me, this is the most important part of the habit cycle to focus on. In my experience, during this stage, I quickly transition from clear, rational thinking to fuzzy, irrational thinking. If I don’t quickly redirect my urge to a positive routine, I am quickly in a one-way path to playing out the negative routine. This is a complicated step to understand for an outsider who might look at you and say, “Just stop already” or who adds insult to injury by saying, “I don’t have those problems, why do you? or "Can’t you see the damage you are causing. If you cared for me, then you wouldn’t do that.” While the person who is voicing these statements is hurt and certainly feeling the results of your negative behavior, for a moment you have to separate yourself from these statements while not dismissing them. Such statements of hurt have the potential to shame and belittle and undermine your self worth so isolate them while you work through your change. Still these are the logical responses from another looking in at your illogical, ‘fuzzy’ state of mind decision making. Routine - These are the physical or mental choices that happen often without much cognitive reasoning. We are in a one-way path to get our reward. Reward - These are the pleasurable feelings that we are seeking whether they be excitement, relaxation, or something in between. There is a growing body of research showing that these ‘rewards’ result in dopamine-delivered stimulus. The following are techniques to interrupt the habit process and indeed, according to Duhiggs research, rather than ‘deleting’ or eliminating a habit, success in changing habits is most likely about replacing a negative habit instead of removing one. So how do we do that. Lets start with some ideas that increase my will power and that minimize the chance of negative triggers. Daily Schedules - In the past, I was lazy about my daily schedule. Most things outside of my 8-5 schedule were variable including my evening routine, and my awake and sleep time. Now, I have a daily schedule with a consistent wake time and bed time. I have embraced the idea of retiring to sleep early and waking early. My most productive hours are now several hours before others awake. I keep track of my sleep time and wake time.I have embraced this ‘one day at a time’ idea that we start over each day. I resolve to do the best in those 24 hours that I can and I am compassionate with myself if I messed up yesterday, and I am aware that each day lived well turns into weeks and months of healthy living and I resolve each morning to do my best and I retire each night giving thanks for what went well and being compassionate with myself wherever possible while still holding myself to a high standard. Checklists - I have a set of healthy activities I try to do every day and I have a printed checklist on my night stand to track them. My wife and kids can see my list and know when I am compliant or not. These consist of rituals like prayer, exercise, scriptures, time with kids and reciting of a personal affirmation. Personal Affirmation - I have written a very personal statement that I say out loud to myself each morning. Amy Cuddy, Harvard researcher and author of “Presence: Bringing Your Boldest Self to Your Biggest Challenges” inspired me by sharing research about the power of such a statement to increase will power, personal courage and confidence. It has made a significant difference. My statement reminds me that God is in charge of all things. He knows me and has a plan for my success, not my failure. He will direct me if I look for his will. I emphasize that my wife and children are counting on me and then I transition to my personal responsibility to make good choices and acknowledge that the ‘small decisions’ matter greatly and that I will be successful starting right now. Personal Assessment - I check-in three times a day and I assess my healthy living. I provide a quantitative assessment from 1-10 with 10 being healthy and 1 being unhealthy and then after the number, I provide a thorough assessment of the triggers, urges, and routines since the last check-in. This process of quick, personal reflection several times a day allows me to ‘own’ the things I did wrong as well as the things I did right. It is my chance to ‘come clean’ and to ‘start again’ to do better during the next part of my day. At some times, I am flippant and dismissive of this personal check-in but I also weekly review my check-ins across the week and when I do, I am amazed to see the patterns both good and bad and then realize the power of the process of personal reflection. External Accountability - I have several people in my life who are watching, and nudging me in the right direction. I have a boss and a spouse and children and parents who all help me to grow and change. However, I also have a 3rd party accountability partner who gets my check-ins three times a day. He is working through the same sort of behavior changes that I am. He gets me and he counsels with me. He ‘listens’ to me and knowing that is powerful. Now, he doesn’t respond to each text. In fact, he may respond to one a week but it is typically that one check-in where i am not doing well and I do need a pick-me-up. I can be brutally honest with him because he has been where I have been. Knowing that he is listening leads me to be more honest and compliant with my personal assessments. And our exchange is all done by text so the process is automated and requires just a few minutes per day. Why is he motivated to help me? Well partially it is become I am his accountability partner too and I try to provide for him what he provides for me and it has made all the difference. Barriers, Redirections and Insertions - In addition to the positive things I try to do daily, I am also actively working through barriers to the triggers that send me into my negative routines or redirections that lead me to positive routines. These are likely to be very specific to the person and to the habit you are trying to change. For some this may mean a change in physical environment, friends, access to devices or social applications and often it might require asking another person to manage the thing we are trying to avoid.To create positive habits, a redirection is critical. This often involves substantial will power and repetition. Instead of that negative routine, perhaps you do 10 push-ups or you make a call to a friend who expects your call. Moving and doing are effective distractions that redirect. Twelve step groups have proven the value of reaching out by phone to another person when feeling weak.And still when we are trying to create positive habits, it is very helpful to insert triggers. For example, if you are trying to floss your teeth nightly, then setting out a bowl of flossers on the counter may help. A prayer rock set on a pillow when you make your bed may increase your prayers. Putting a bowl of vegetables in front of the sweets may reduce the temptation. Perhaps you can see now how some of these six techniques combine to help change behavior. They are additive and complimentary to each other. Sadly, there is no silver bullet and the path to success is riddled with slips and struggles and regular challenges, but each day we get to try again. Each day we take 24 hours to do our best to live healthy lives and the best we can give is good enough. We are not islands floating alone, but are interconnected to each other in meaningful ways with the potential to make material differences in each other’s lives. Our hope is to help humanity live healthy so that each of us have peace and joy so we can be our best selves. We don’t pretend to suggest that this behavior changing work is easy. In fact it is one of the primary purposes for many of us who are trying to improve over life. This work is hard but it is worthwhile. And we aren’t trying to minimize the negative impact of our behavior on others. Instead, we acknowledge that our lives are intertwined and that we have a material impact for good and bad on those around us. We applaud the many battles that you are fighting and the courage that you are putting forth especially if you are on the supporting end helping someone to overcome a divisive mental or behavioral health challenge. Here’s to taking the next 24 hours to live the best day you can. What works for you? Did we miss any ideas that help you in your behavior change?